TRENTON, N.J. (AP) — Regulators say the 2017 governor's race in New Jersey was the state's second most expensive, with candidates and independent groups spending more than $79 million. The New Jersey Election Law Enforcement Commission says $24.5 million spent by independent groups set a new record. However, executive director Jeff Brindle says state public disclosure rules for such committees are "woefully outdated" and most spending can be done without voters knowing who provided the money. TRENTON, N.J. (AP) — New Jersey Democrats have a wish list of changes they want to enact after GOP Gov. Chris Christie leaves office in January and Democratic Gov.-elect Phil Murphy takes the reins. But unlike during Christie's two-terms, Murphy and the Democrats won't have a Republican foil to confound their efforts — or cast political blame if the party cannot achieve what it promised voters. 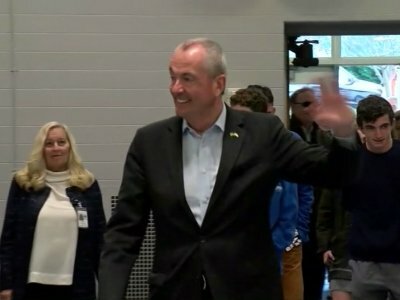 TRENTON, N.J. (AP) — New Jersey Democratic Gov.-elect Phil Murphy says his top deputy will also lead the state department that played a key role in helping the state recover from Superstorm Sandy. Murphy's transition office said Thursday that Lt. Gov.-elect Sheila Oliver will take the helm of the Department of Community Affairs. The department coordinates state aid to towns and cities and oversees code enforcement. Sheila Oliver completes sweep, makes political history in N.J.
With Democrat Phil Murphy winning New Jersey governor's race, his running mate, former Assembly Speaker Sheila Oliver becomes the state's first Black lieutenant governor. She is now the second highest-ranking official in New Jersey. Oliver gained her new title after Tuesday's election that gave Murphy a sweeping victory over the Republican candidate, the state's current lieutenant governor Kim Guadagno. Her running mate on the GOP ticket was Carlos Rendo, the mayor of Woodcliff Lake. TRENTON, N.J. (AP) — Democrat Phil Murphy spent his first day as New Jersey's governor-elect at a train station on Wednesday, thanking voters for choosing him to succeed term-limited GOP Gov. Chris Christie. At a commuter rail station in Hoboken, Murphy said he's "literally 100 percent" concentrating on transitioning to the state's top elected office. TRENTON, N.J. (AP) — Proponents of legalizing recreational marijuana in New Jersey say Phil Murphy's win Tuesday night will pave the way for pot legislation. RICHMOND, Va. (AP) — Voters in Virginia and New Jersey gave Democratic gubernatorial candidates large victories Tuesday and sent a clear message of rebuke to Republican President Donald Trump. In Virginia's hard-fought contest, Democratic Lt. Gov. Ralph Northam defeated Republican Ed Gillespie. In New Jersey, front-running Democrat Phil Murphy trounced Republican Lt. Gov. Kim Guadagno to succeed unpopular GOP Gov. Chris Christie. ASBURY PARK, N.J. (AP) — Democrat Phil Murphy defeated Republican Lt. Gov. Kim Guadagno on Tuesday in the race to succeed term-limited Gov. Chris Christie, who failed as a presidential candidate and has seen his popularity ratings plummet. Murphy emerged victorious after leading Guadagno in the polls and in fundraising in a race that revolved in part around the Republican governor's unpopularity. New Jersey's next governor, Democrat Phil Murphy, says his party's victory sends a message to President Donald Trump that the county is "better" than his politics of division. Murphy spoke Tuesday from Convention Hall in Asbury Park, New Jersey, after he trounced Republican Lt. Gov. Kim Guadagno. TRENTON, N.J. (AP) — Lt. Gov. Kim Guadagno spent her final weekend campaigning in New Jersey's governor's race on a bus tour, with two former Republican governors praising her as the best candidate. TRENTON, N.J. (AP) — New Jersey voters go to the polls Tuesday to pick the successor to Republican Gov. Chris Christie and a new Legislature. They'll also weigh in on how much money should be spent from the funds collected from lawsuit settlements involving the cleanup of natural resources and whether to approve borrowing for libraries. At a March town hall-style meeting in northern New Jersey, a woman named Linda told Phil Murphy that she was concerned about his Wall Street past. “What are you going to do for the little guy?” she asked. It’s a question that still follows Murphy, 60, a former longtime Goldman Sachs executive and the Democratic nominee for governor. His Republican opponent, Lt. Gov Kim Guadagno, is stoking concerns about his time as a banker less than a week before the Nov. 7 general election. SEA BRIGHT, N.J. (AP) — Republican gubernatorial candidate Kim Guadagno (gwah-DAH'-noh) will be hitting the road in a bus tour to visit all of New Jersey a week before the election. PARAMUS, N.J. (AP) — Former President Bill Clinton is rallying support for Democratic New Jersey gubernatorial candidate Phil Murphy. Clinton spoke Tuesday in Paramus for Murphy, who faces Republican Lt. Gov. Kim Guadagno in the Nov. 7 election to succeed GOP Gov. Chris Christie. Clinton says Guadagno's recent TV ad that says Murphy would support violent criminals who also are in the country illegally is aimed at getting her base to the polls. TRENTON, N.J. (AP) — The Democratic candidate running to succeed Republican Gov. Chris Christie said Monday that voters should judge him on whether he grows the state's economy and whether it becomes "fair." TRENTON, N.J. (AP) — Democratic gubernatorial candidate Phil Murphy spoke with The Associated Press on Monday. Republican Lt. Gov. Kim Guadagno's campaign hasn't responded to a request from the AP to reschedule an interview, after two previous interviews were canceled. Struggling to win over the Hispanics who helped power Republicans to victory four years ago, New Jersey gubernatorial nominee Kim Guadagno went the opposite direction Monday, embracing a Trump-like call to crack down on sanctuary cities in the state. Phil Murphy, a former Obama administration ambassador to Germany and Goldman Sachs executive, avoided specifics, telling The Associated Press his plan to grow the infrastructure and innovation economies couldn't be boiled down to one legislative or regulatory change. TRENTON, N.J. (AP) — The Democratic front-runner in New Jersey's governor's race is getting a double dose of help from the Clintons. Hillary Clinton joined Phil Murphy at a campaign fundraiser Sunday night, and former President Bill Clinton is scheduled to join him at a rally on Tuesday in Paramus. Bill Clinton will appear at the get-out-the-vote rally at a local electrician's union headquarters. WAYNE, N.J. (AP) — The top two party candidates in New Jersey's gubernatorial race disagreed in their final debate Wednesday over how to address the state's property tax, and walloped each other on the GOP's handling of the state's economy and the Democratic candidate's plan to pay for his promises. FORT LEE, N.J. (AP) — Democrats hoping to win this year's contest to succeed Republican Gov. Chris Christie dragged the George Washington Bridge lane closures scandal into the campaign on Tuesday, with the mayor whose streets were deliberately gridlocked in 2013 taking aim at the administration. MONTCLAIR, N.J. (AP) — The two top party candidates to be New Jersey's next lieutenant governor clashed forcefully in Monday's first and only debate before the Nov. 7 election to succeed GOP Gov. Chris Christie, with the Republican candidate calling the Democrats the "the most anti-cop" ticket in state history. TRENTON, N.J. (AP) — New Jersey wildlife officials have updated the number of black bears killed during the state's latest hunt. Data released Monday shows 243 bruins were culled during the six-day hunt staged last week in eight northern counties. That includes two kills that were officially counted Sunday. The kill total is a sharp decrease from last year's hunt, when 562 bears were culled. KEARNY, N.J. (AP) — New Jersey Gov. Chris Christie defended his lieutenant governor on Friday over a campaign ad that was blasted by former Democratic Vice President Joe Biden as "the return of Willie Horton." EDISON, N.J. (AP) — Former Vice President Joe Biden on Thursday weighed in on the race to succeed New Jersey Gov. Chris Christie, criticizing a new campaign ad from Republican Lt. Gov. Kim Guadagno as the "return of Willie Horton" and casting the election as an opportunity to rebuke President Donald Trump. TRENTON, N.J. (AP) — The Democratic candidate in New Jersey's governor's race on Tuesday said he didn't take a "dime" from disgraced movie mogul Harvey Weinstein and called on Democrats around the country to return any money they've received from him. Phil Murphy said he has not received any contributions from Weinstein. NEWARK, N.J. (AP) — The first debate between two top party candidates to succeed Republican Gov. Chris Christie featured name-calling, comparisons to President Donald Trump and sharp differences on policies regarding taxes, health care, marijuana legalization and sanctuary cities. Democrat Phil Murphy says he didn't ask for or get a "dime" from disgraced movie mogul Harvey Weinstein during a debate with his GOP rival in New Jersey's gubernatorial campaign. But his Republican opponent Lt. Gov. Kim Guadagno has called him a "coward" for failing address the Weinstein scandal until after her campaign raised the issue on Tuesday. TRENTON, N.J. (AP) — A national group that promotes gun control has given its support to Democrat Phil Murphy in the state's gubernatorial race. The Brady Campaign to Prevent Gun Violence announced its endorsement Monday during a news conference in Trenton. State officials say several bears have been culled so far during the opening day of New Jersey's latest bear hunt. And two protesters have been arrested at a check station in Fredon. Authorities say a woman was taken into custody after lying down in a roadway to block a hunter's vehicle. And a man was detained after he moved from an area designated for protesters into a roadway. Gov. Chris Christie's top deputy says she "enthusiastically" backs his effort to attract Amazon's second headquarters to New Jersey. Kim Guadagno is the Republican nominee for governor in the Nov. 7 race to succeed the term-limited Christie. NEWARK, N.J. (AP) — New Jersey native and former NBA star Shaquille O'Neal has endorsed a Democrat in this year's contest to succeed Republican Gov. Chris Christie, whom he supported in 2013. Democrat Phil Murphy's campaign says O'Neal backed Murphy on Monday during a fundraiser in Newark. O'Neal had backed Christie in his 2013 re-election bid, calling the governor a "great man." He also appeared in an ad for Christie. NEWARK, N.J. (AP) — New Jersey native and former NBA star Shaquille O'Neal is backing Democrat Phil Murphy in this year's contest to succeed Republican Gov. Chris Christie. SOMERSET, N.J. (AP) — Republican Gov. Chris Christie says the Democratic candidate to succeed him is a "coward" for failing to clarify his position on an expiring provision that affects property tax rates. Christie spoke Wednesday at an unrelated event in Somerset and called on Phil Murphy to take a position on the 2 percent interest arbitration cap expiring in December. TRENTON, N.J. (AP) — The Republican Governors Association on Tuesday entered the race to succeed term-limited Gov. Chris Christie with an ad taking aim at Democrat Phil Murphy. The new 15-second spot shows a welcome-to-New Jersey sign as a narrator says Murphy believes taxes are not "high enough." Murphy is leading in polls and fundraising over GOP Lt. Gov. Kim Guadagno in the Nov. 7 election. TRENTON, N.J. (AP) — The campaign of Democratic gubernatorial candidate Phil Murphy says former President Barack Obama will be campaigning for him in the state ahead of Election Day. Campaign spokesman Dan Bryan said Tuesday that the details haven't been finalized. But Obama will be at an event for Murphy in New Jersey. Obama appointed Murphy ambassador to Germany. Murphy also served as finance chairman for the Democratic National Committee and as a Goldman Sachs executive. NEWARK, N.J. (AP) — The Democratic candidate for New Jersey governor Wednesday said his Republican rival's initially brief response to a lawmaker posing with a Confederate flag was a "failure," while she said her opponent was distracting from his calls for higher taxes. The dueling campaigns to succeed term-limited Republican Gov. Chris Christie ratcheted up pressure on one another as Democrat Phil Murphy and Republican Lt. Gov. Kim Guadagno inch closer to the Nov. 7 election. TRENTON, N.J. (AP) — Democrat Phil Murphy is proposing $1.3 billion in new taxes in his campaign for New Jersey governor, not $75 billion as his Republican opponent has claimed, the Murphy campaign said Friday. Campaign spokesman Derek Roseman said the campaign provided estimates on Murphy's revenue-raising proposals to "debunk" claims by Republican nominee Lt. Gov. Kim Guadagno in her campaign ads. Roseman said her figures were "demonstrably false." MOUNT LAUREL, N.J. (AP) — A former ambassador to Germany and current Democratic nominee for governor said on Tuesday there's cause for concern about President Donald Trump's response to a deadly white supremacist and neo-Nazi rally. Phil Murphy, speaking after an unrelated event, said Nazism didn't appear in a "quantum moment" and "we should all be very concerned" about the country's leadership. TRENTON, N.J. (AP) — New Jersey's governor and the candidates hoping to succeed him in this year's election are denouncing white supremacists in the aftermath of the violent clashes in Virginia. Their statements came amid several weekend rallies in New Jersey to protest the deadly violence. WEST NEW YORK, N.J. (AP) — The state's Republican candidate for governor on Thursday selected as her running mate a Cuban-born mayor who supported U.S. Sen. Marco Rubio's presidential bid.